BW-14FISH-BWLD Size: 14" Features: -Blue/White finish. -Stand is not included. Material: -Ceramic. Distressed: -Yes. Color: -White; Blue. Shape: -Round. 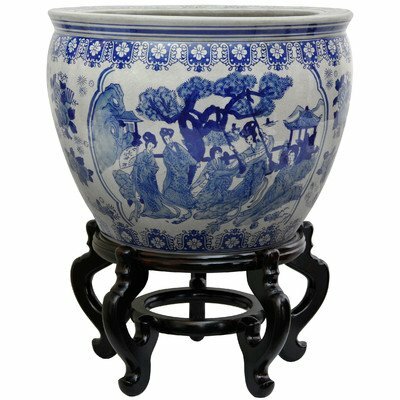 Material Details: -Chinese porcelain. Dimensions: Size 12" - Overall Height - Top to Bottom: -8.5". Size 12" - Overall Width - Side to Side: -12". Size 12" - Overall Depth - Front to Back: -12". Size 14" - Overall Width - Side to Side: -14".